But Tom thought nothing about what the river was like. All his fancy was, to get down to the wide wide sea. And after a while he came to a place where the river spread out into broad still shallow reaches, so wide that little Tom, as he put his head out of the water, could hardly see across. So he went back a little way, and crept into a crack of the rock, just where the river opened out into the wide shallows, and watched for some one to tell him his way: but the otter and the eels were gone on miles and miles down the stream. There he waited, and slept too, for he was quite tired with his night’s journey; and, when he woke, the stream was clearing to a beautiful amber hue, though it was still very high. And after a while he saw a sight which made him jump up; for he knew in a moment it was one of the things which he had come to look for. Such a fish! ten times as big as the biggest trout, and a hundred times as big as Tom, sculling up the stream past him, as easily as Tom had sculled down. Such a fish! shining silver from head to tail, and here and there a crimson dot; with a grand hooked nose and grand curling lip, and a grand bright eye, looking round him as proudly as a king, and surveying the water right and left as if all belonged to him. Surely he must be the salmon, the king of all the fish. 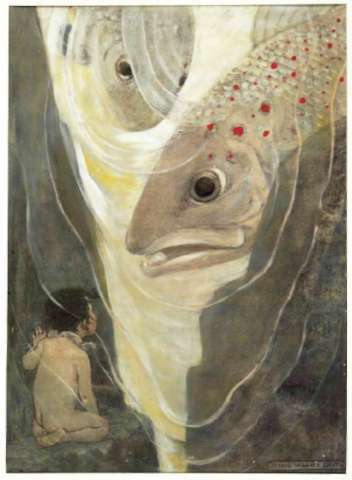 Tom was so frightened that he longed to creep into a hole; but he need not have been; for salmon are all true gentlemen, and, like true gentlemen, they look noble and proud enough, and yet, like true gentlemen, they never harm or quarrel with any one, but go about their own business, and leave rude fellows to themselves.